Here are the official voting results of Big Brother Naija 2018 week 10. 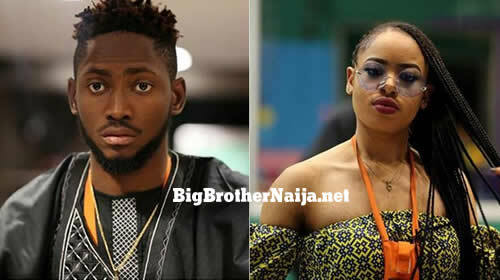 This week’s voting results indicate that Miracle received the highest percentage of votes while Rico Swavey received the least percentage of votes and that is why he has been evicted from the house. Well lets proceed and take you through more details of Week 10’s voting results below. The voting results indicate that Miracle received the highest percentage of votes, 25.76%. 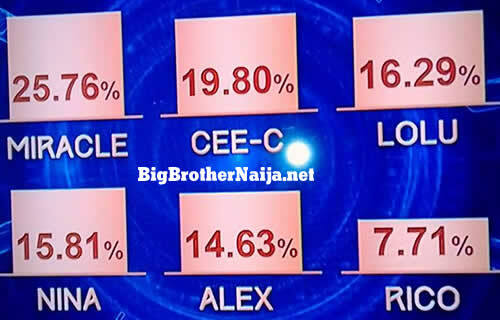 Cee-C came in second position with 19.80%, Lolu came in third with 16.29%, Nina came in fourth with 15.81%, Alex came in fifth with 14.63% and lastly Rico Swavey received just 7.71%. Below is a summary of how the voting audience voted this week. And once again, thank you all for voting and we wish Rico Swavey the best in all his future endeavours. I must commend the officials of Big brother for saving Alex because she's one of the most entertaining housemates you have in big brothers house and she deserves to reach fina, "Kudos to you Biggy". Instead of evicting her, evict Khloe and Anto and you have the final six made up of Miracle, Tobi, Cee C, Lolu, Nina and Alex. Thanks Biggy for saving Alex, she is very entertaining. They absolutely saved her, if u do the math, 2 housemates were supposed to leave but because She was the one to leave they could not, pure business strategy..Alex is entertaining, she must just stop bashing others…. Anto must leave this week PLEASE BIGGIE…. am soo happy my Cee-C is safe and still in the house Thank you to all that voted for her! team Cee-C, #WeLiveHere for our King!! That's very true, I also figured it out that two housemates were supposed to be evicted last night but because Alex was the second victim, Biggie didn't see that as a good business move. So I think the producers of the show decided to evict one housemate, but all the same we love because she entertaining. I'm now looking forward to this week's voting and see who makes it to the grand finale. I also want to thank everyone who voted for Cee C, South Africa, Nigeria, Kenya, Nairobi, Zambia, Zimbabwe the whole Africa, thank you, Thank you Thank you. We can do this guys trust me…. Please put all of them up for possible eviction Biggy.#Team Cee-c, team fake, team lashes, team dwarf, team arrogant etc. We fear nothing..BRING IT ON We ready. @SouthAfrica, here is what might happen today. There will be a Head of House challenge and whoever wins will be safe, then all the rest will be up for possible eviction. That's what I think but lets keep watching and see what happens.